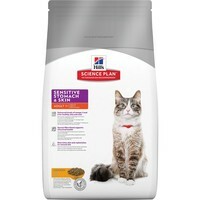 Hills Science Plan Sensitive Stomach & Skin Dry Food for Adult Cats provides precisely balanced nutrition for sensitive digestive systems and to improve skin and coat health. Designed to promote gentle digestion, this delicious recipe has been formulated with clinically proven antioxidants and an optimal balance of highly digestible protein and gentle fibre. Furthermore, the unique fibre blend and high protein content, promote overall intestinal health, lean muscle maintenance and an ideal bodyweight.